I'd like a bit more control than just text size, width, and background color. I downloaded and tested New. It's a good app overall so I apologize if my feedback only mentions flaws. • The New, Open and Save icons are not intuitive. I'd like an option to display text with the icon. • You can only have one form open at a time. I'm not sure how much of a problem this will be. • If a select menu has a really long name, it can extend beyond the form. There should be a max-width option. • If the goal is just to get the html code, we're almost there. The only issue is that the line breaks and indents are very inconsistent. For example, radio buttons have 2 line spaces between each option, but divs are right after one another. This does not affect the function of the form, but it makes later edits/troubleshooting harder. • If the goal is to have a fully styled form with CSS, I'd like a bit more control than just text size, width, and background color. I'd like a few presets with different graphic elements. Control over form padding; font(s); label text color; input text and background colors; button size, text and background colors; etc. I know I can edit the CSS file, but since the goal is to make forms easy to build without coding, I'd like to be able to do it in the app. • I would move all the style options to a 3rd tab. So everything in Form and Element tab is used to generate the HTML, and everything in the Appearance tab is used to generate the CSS. • The form background color should be in the CSS file, not inline. 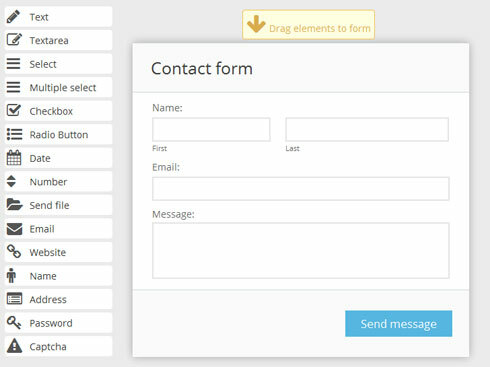 • There should be an option to give the send form to email html a class and build all the styles based on the class instead of the form ID. This would allow multiple forms on a web page using the same style sheet.